WHAT IS THE DIFFERENCE BETWEEN KEFIR AND YOGURT? Kefir and yogurt might look similar, but what sets them apart is the way the two are cultured. Kefir is made from Kefir grains , which can be cultured at a very specific temperature range, has multiple strains of yeast and bacteria. Yogurt, on the other hand, has only bacteria and only one kind, for that matter, and it requires room temperature to be readied. Yogurt is made by mixing a spoonful of an old batch of yogurt to fresh, slightly warm milk. Kefir is made with the grains that multiply with every batch you make. Kefir has 30-40 different strains of bacteria compared to one in yogurt. 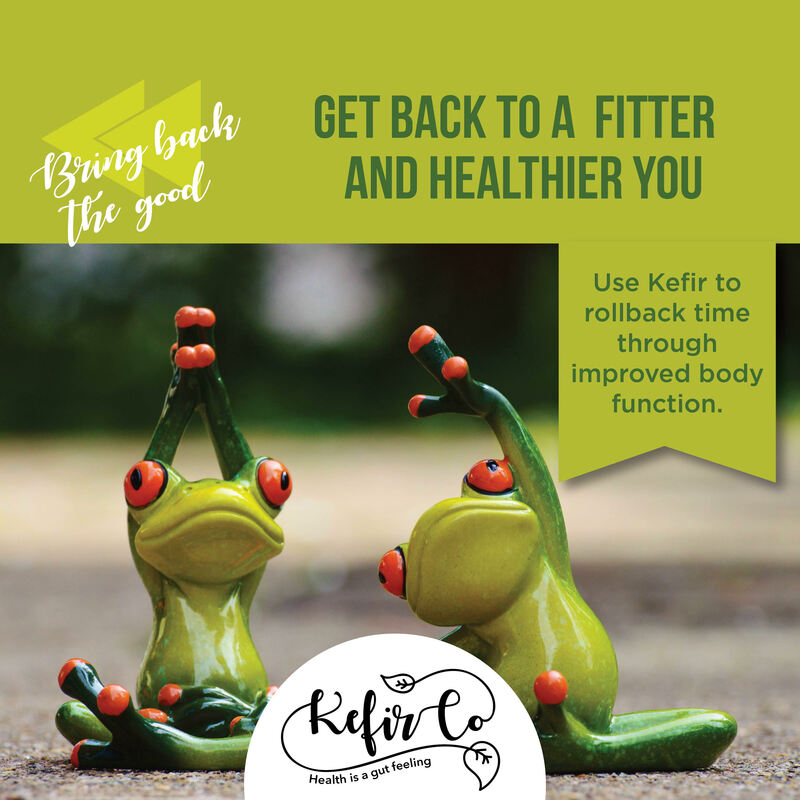 Ensure better digestion with Kefir Co | The best probiotic drink Our A2 Milk Kefir is a perfect replacement for the expensive protein shakes with added advantages such as absorbable calcium and probiotics to ensure better digestion too!!! Order sample today for 100 rupees only. For subscription, please contact +91 9810475056. Feel good with Kefir | The Best probiotic drink The word Kefir comes from a Turkish word "Keif" which means "feeling good." That's exactly how you start feeling as you have kefir regularly. Order sample today for 100 rupees only. For subscription, please contact +91 9810475056. Authentic kefir can only be made by real kefir grains, not from any kind of packet or powder. The unique live and self-propagating grains make this a beverage one cannot find in the stores. The grains vary in color from clear to brown depending on the sugar used when fermenting! Kefir is an elixir of a drink which has a low glycemic load and no caffeine. It has many health benefits, a great flavor and is also well-tolerated by many diabetics. It has a larger spectrum of probiotics which are brilliant for the functioning of the human body. We have in fact also helped treat pet animals with kefir and there has been tremendous improvement, stabilising their rapidly flailing health. Kefir, the best probiotic in India, made available to you by KefirCo, has more reasons than one why everyone should have a glassful each day. Kefir is a powerhouse of calcium, Vitamin K12, which are both very beneficial to bone health, B Vitamins - which is essential for the blood and the nervous system to run - phosphorus and protein, and also aid with easy digestion . http://www.huffingtonpost.ca/2015/11/05/kefir-benefits_n_8479760.html for more details. Kefir Co a perfect alternative to aerated drinks | Best Probiotic drink in Delhi Spring Water kefir is a refreshing alternative to aerated drinks and that too with a probiotic punch! Order sample today for 100 rupees only. For subscription, please contact +91 9810475056. Say hello to Kefir, the best probiotic in India, and bid adieu to your skin troubles! Whether it’s acne or eczema, most skin disorders have one thing in common: inflammation. Not just the visible inflamed pimples you see on your skin, but inflammation within your gut that’s tipping your entire wellbeing off balance and causing those stubborn outbreaks. The bottom line is: you need to fix your gut to heal your acne. Digestion related issues can often be a minefield and there isn’t a “one solution fixes all”. However, you can really help support all those good guys (and reduce the bad guys!) in your gut with kefir. Kefir, one of the most probiotic rich foods on the planet - it’s super rich in friendly bacteria, reduces inflammation and helps support and protect the lining of the gut. This helps you to absorb more nutrients from your food and increases the efficiency of toxin removal. Go on, and grab your glassful right away! HOW KEFIR - OUR MOST POTENT PROBIOTIC - HELPS WITH THYROID. Most thyroid conditions are auto-immune diseases. There are billions of lymphocytes and other immune cells in the gut, which protect the body from viruses, bacteria, and other invaders. This is why most people with thyroid conditions also experience frequent bloating, gas, constipation or diarrhea. A diet change will help your gut tremendously. “All disease begins in the gut“, said Hippocrates, the father of modern medicine. Kefir, our super food loaded with probiotic bacteria and yeast, helps line the intestinal lining with these bacteria and creates an immune barrier to pathogenic (bad) bacteria, repairing your gut, its health and, by extension, the health of your entire body, including thyroid.